After 3 weeks spent living in Bali and exploring as much of the island as possible , I thought it useful to share our thoughts on where to stay in Bali. Before we arrived I was worried that, as like so many places do, it would not live up to all of the hype. Famed for its golden sandy beaches, blue warm water, amazing surfing opportunities, it sounds like the surfer's paradise. Luckily enough, it lived up to that reputation and more. But what we’ve quickly discovered is that, even though you can indeed visit this place on a budget and dream of getting better on the waves, there is so much more on offer for families, couples and solo travellers alike. There are simply so many unique places to stay in Bali that you will struggle to find elsewhere in the world. Canggu is definitely a very lively and youthful place to stay, and within walking distance of some of the best hotels for Bali single travellers; you have access to tonnes of restaurants, bars, a few clubs and of course the beach for surfing. I picked Canggu as the best place for budget travellers though, to be honest, Bali, in general, is pretty cheap and you can easily spend a few days in each location before moving on. 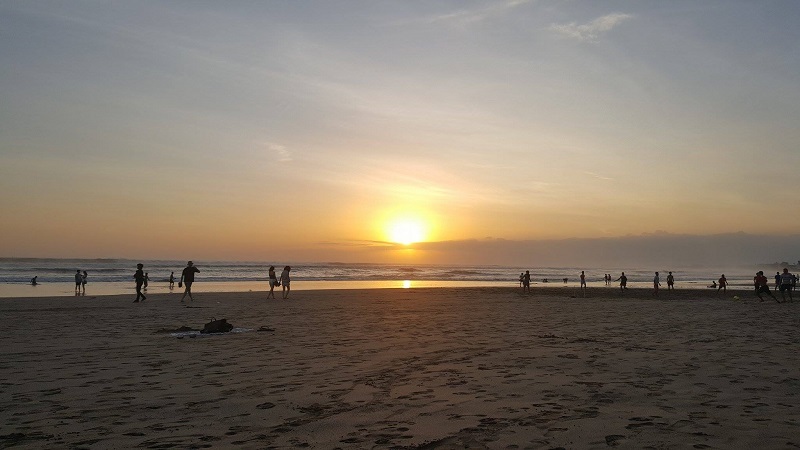 It just seemed like Bali solo travellers would fit in really well here and you wouldn’t even need a moped to get around if you just fancied staying in Canggu and making companions. We paid 38K IDR a day for our mopeds (a little over £2), and fuel is ridiculously cheap so you can easily get around and visit other places if you wanted. Uluwatu is without a doubt the top surf spot in Bali for those with enough experience and courage to try out the enormous waves. Uluwatu Beach is much famed for its almost perfect reef break that’s laid host to countless professional surf competitions throughout the years. 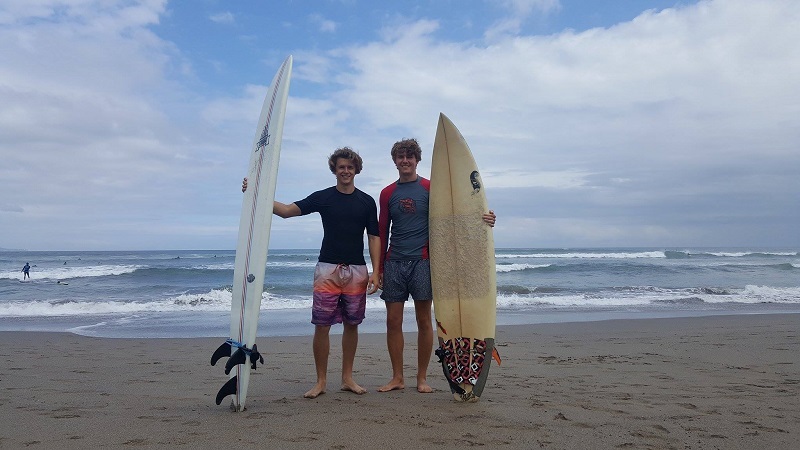 However by staying in the deep south of the island, you’re not just limited to Uluwatu, but also the other much larger surf breaks the island has to offer which are all situated in the South, including Padang Padang and Balangan. As a rule of thumb, the biggest surf breaks are in the South of the island, below Jimbaran, and the beginner waves are further North, above Jimbaran. So if you’re a beginner you’re going to want to start up in Kuta or Canggu, both of which have tonnes of instructors offering surf lessons. With a small amount of experience, you can head to Balangan and stick in the shallower breaks just off the left side of the beach. 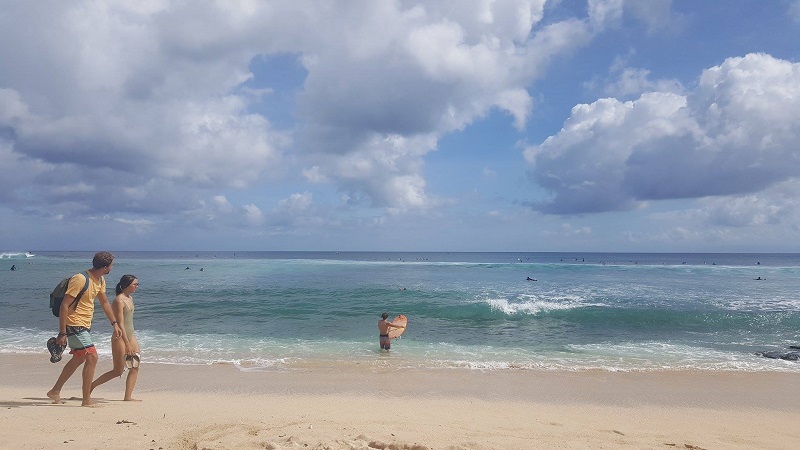 Balangan is a reef break so if you aren’t too comfortable in the water and are worried about wiping out, it’s probably best to stick to a nice sandy beach like Kuta until you build up your experience. The reason I suggest staying in Jimbaran is that, even though Jimbaran beach has little to no waves, it’s a great central location to reach all of the coast. Just be creative at deciding what beaches would suit you best before deciding where to stay in Bali. 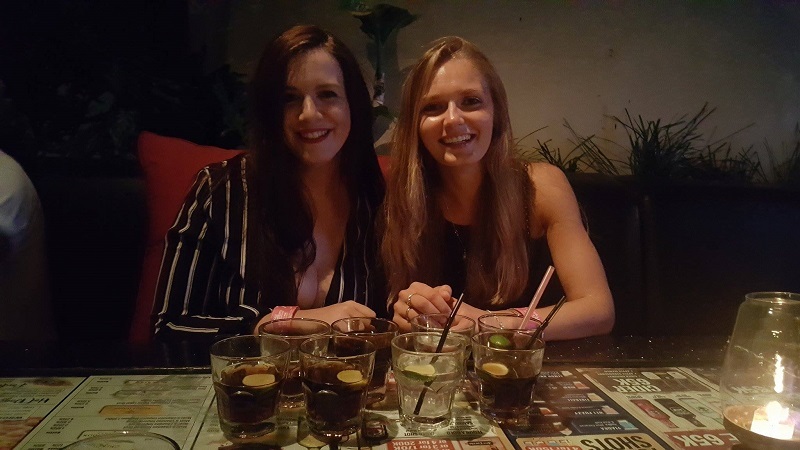 From our experience, Kuta is the place to be for nightlife and places to eat and drink; and we also found it the best place to stay in Bali for shopping. You can easily spend all day chilling on the beach, possibly catching some waves, before heading for a big night out. Kuta’s great for value as well, and I’d highly recommend hitting up Sky Gardens. It’s the biggest club in Bali and from 5pm-9pm every night you can get unlimited food and drinks for 115K IDR (roughly £7). Then just stay in after and check out all the different rooms on offer. Or, just head out to one of the numerous other bars and clubs along the Poppies II road. 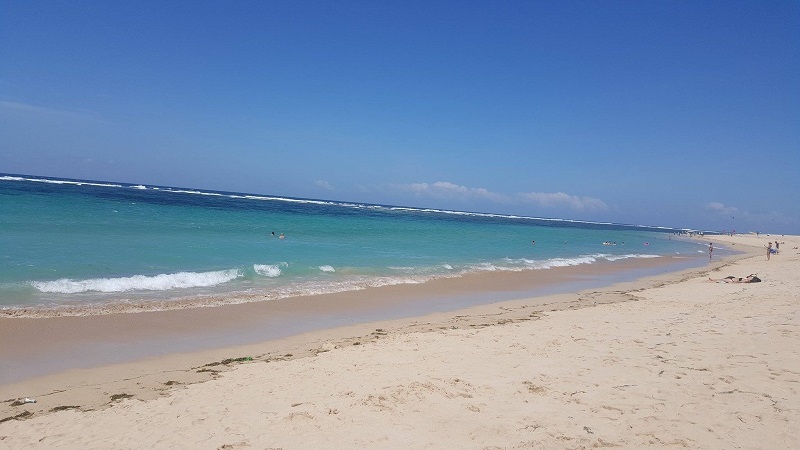 Your other option is to stay up in Canggu which is a little more isolated in terms of heading to other beaches, but still has a few small clubs, plenty of restaurants and tonnes of other travellers. Sky Garden in Kuta is a budget travellers dream club! Nusa Dua is situated just below the Denpasar airport and on the Eastern side of the island. It has a much more family-oriented feel to it and beautiful blue waters and beaches. There’s plenty of places to eat and it’s the famed area for its watersports. It’s a central location for visiting other parts of the island and isn’t geared towards surfers as the waves there are quite poor for many months of the year. Alternatively, if luxury is more important to you when deciding where to stay in Bali for families or even couples, then you can head to Sunur which seems to be packed with resorts and restaurants that wind all the way up the beachfront. The waters are calm, and the beaches clean, making it great for kids whilst parents relax in the sun or sit in the pool. There are of course many other destinations to stay in, and these suggestions are largely based in the South, which is where we spent most of our time. One thing I would say is that, if you get the chance, everyone should visit Ubud which is about a 2-hour drive North from Denpasar Airport depending on what time of the day you leave. It has the Monkey Forest, the Tegenungan waterfall, the Tegalalang Rice Terrace and Mt Batur Volcano which are all simply unmissable; and I’m sure many families or travellers choose to spend at least a few days up in Ubud. If you’re looking where to stay in Bali for honeymoons, then you are spoilt for choice for romantic destinations. 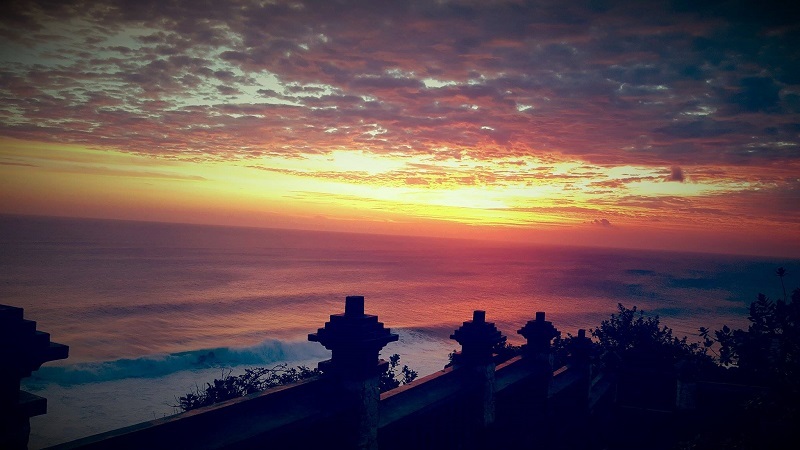 From what we saw, Seminyak has some beautiful sunsets and numerous luxury apartments and villas along its coast. However, there are numerous spots all over the island that are recommended. 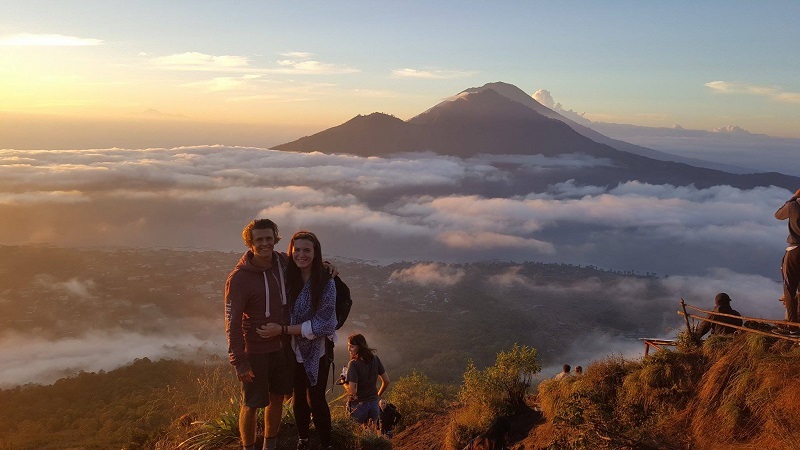 Many of those popular spots are up in Ubud, but for a more detailed list of places, here’s a useful blog post on Bali honeymoon ideas. As well as this, you have other famous islands nearby that are just a short boat ride away. These are often far less busy than Bali, especially during the popular Summer months and we fully intend on going back and explore them ourselves. For now, here's a useful guide you can read on Bali's sister islands. Another point is that, if you’re feeling brave, you should rent out mopeds for all of, or most of your stay. As mentioned earlier, they work out anywhere from 35K-70K IDR (£2-£4) a day depending on how long you rent them for and fuel costs next to nothing. If, like me, you’ve never ridden a moped before in your life and prefer the safety of 4 wheels, don’t worry they’re easy to get used to. In fact, Bradley wrote an entire guide on mopeds here. We ended up doing at least a thousand miles during our stay there and drove all over the island as far north as Ubud and as far south as Uluwatu. It gives you so much freedom on where you stay in Bali, but do be warned that the drivers there are seriously crazy so keep your eyes peeled. The best thing you can do is embrace the chaos and learn to drive like the locals do, it’s by far the quickest way to get around Bali. Oh, and for nights out, stick to Uber which is also crazy cheap. If there’s anywhere that I’ve missed that you think would be a great suggestion then I’d love to hear it below. I fully intend on revisiting Bali in the near future so am keen to hear of new places we should visit that we may have missed out on.